Still a dream, or is it becoming reality? So we are pretty much at the beginning of a revolution in Artificial Intelligence. It’s already transforming our world, from simple things like product recommendations, through to artificial hearing for the deaf. AI is here, and it’s beginning to make an impact across the board. One thing is for sure; it’s going to transform how we work particularly in the sales and marketing space. We’re heading towards a smarter world, which we can see through the mega trends over the last 20 years. From the creation of integrated networked systems, to the Cloud and Cloud computing, onto social and mobile, right up to IOT (the internet of things), all of this has been leading to AI. It’s what happens when you create a system that captures massive amounts of data, with pretty much limitless computing power. We can see AI working in its infancy already with movie recommendations on Netflix, or a simple product suggestion on Amazon. But at this time, for most of us, it’s out of reach. The reason being it’s pretty tricky, and takes a lot of effort and investment to get started. AI begins with data science, and to do the science, you need the data. We then need to take that data and turn it in to something usable. You then need specialists to build predictive models based on secure and scalable foundations, and that’s just the start! You then need to work out how it fits in with your business context. In truth for most of us mere mortals, implementing AI in to our businesses is a dream that just doesn’t exist… or does it? At the recent Dreamforce conference from Salesforce, we saw what will undoubtedly be the first (or one of the first) in a long line of large scale companies moving to democratise the AI landscape on a massive scale. 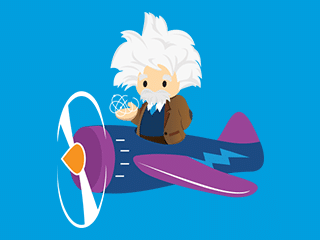 Their new Einstein platform packages up a simple, easy to implement AI system to aid your CRM. At Quantum, we’ve been watching companies that are developing AI platforms that can be implemented as a turnkey solution into every business. Our team is well versed in the ability to map data and turn this in to actionable insights, and we’re now beginning to create models that can forecast behaviour and build scalable campaigns to respond to this. We already use some of these platforms for our existing clients, helping them to personalise, customise and automate marketing activations, and we’re already seeing some exciting returns. The ability to take big data and turn it in to insights and actions quickly and simply is about to be here, available to all, that’s you AND your competition. So what do you need to do right now? Well it’s all about data, the bigger the better. You need to be collecting as much data on your consumer’s, customers, users and fans as possible. Their journeys to purchase, their interactions, their habits and their passions. Capture everything! ….And yes, it’s probably worth giving us a call sooner rather than later. We’d love to hear your thoughts on how you could implement AI in your organisation, and if you’d like to talk to us about how your business or brand can build a digital marketing platform for the future, then why not drop us a line.